A new high-temperature airflow test facility is being built in Colorado where Reaction Engines will validate a key part of its SABRE air-breathing rocket engine. The project is an additional investment by Reaction Engines into ground test facilities. The company said it is ‘progressing rapidly’ on the previously announced TF1 engine test facility in the United Kingdom where the first ground-based demonstration of its SABRE air-breathing rocket engine will take place. Dubbed TF2, the Colorado test facility consists of a test building and a control room located on the east side of the Front Range Airport. The hot air for the testing will be provided by a modified afterburning jet engine configured to produce varying flowrates and temperatures. “We are tremendously excited that Reaction Engines is locating their new engine test facility here at Front Range Airport and, as the future site of Spaceport Colorado, the linkages between high-speed aviation uses and the commercial space applications for this new technology are a perfect fit,” said Dave Ruppel, Front Range Airport Director. Once TF2 achieves full operations, and following the completion of HTX testing, the company plans to make the facility available to industry, technology developers, and universities. A good example of proper, planned R&D with the benefit that it will be used after the program is completed for research purposes. Hope that The Engineer will continue to follow this project’s development, these are real developments and well reported. Why on earth build this test facility in the US? The British government should have intervened to prevent this, or are we going to allow another UK technological development be exported with no benefit to Britain. As for the space angle, the UK government has said that it wants to develop a spaceport here, so this would have tied in neatly. Once again, the idiotic British government has betrayed our long-term economic national interest. Didn’t Richard Branson do something similar with his Virgin Galactic – took his idea and investment across the Atlantic. Not really; in that case, the idea was transatlantic to start with. Without Burt Rutan and Spaceship One, it’s unlikely Branson would have thought to get involved in space tourism. Fair comment I suppose. As the UK had no rich entrepreneurial aerospace designer like Burt Rutan (and still hasn’t!) Branson had to go across the “pond” in order to get involved. Agree wholeheartedly with what you wrote. If our backward looking government had taken one month’s funding from our foreign aid budget (£1B) which goes who-knows -where, we would have had the funding to fully test and build this engine. Ian writes that DARPA will be funding the test. What he didn’t mention is that DARPA only funds US companies. And who funds DARPA? The USG and DOD. If you want to know how this country’s government treats people with new aerospace ideas just read the life story of (Sir) Frank Whittle and his jet engine and the disgraceful way he was treated by the government of the day culminating in him losing all control over his design, with it ultimately being handed to RR. The final humiliation was him being ordered (he was a serving RAF officer at the time) to travel to Washington along with his design which was given foc to the newly formed GE company. Some things never change I guess. All that’s happening is that DARPA ordered an engineering article from a UK engineering firm. What IP is being ‘given away’, exactly? Perhaps Reaction Engines needed more “support” then the UK is permitted to give at present? Not trying to inflame matters here,but I’m about 40 miles from there and intend to look into the program. There is a huge amount of open space surrounding that airport, making it ideal if things go bad. Is it possible that such concerns determined the location? Noise might have been a concern, but for this kind of test, things going bang are very unlikely. The Pre-cooler has been tested in the UK in 2012 at ambient temperature and was shown to operate as designed. The Americans are very interested in this engine for hypersonic propulsion but first want to see it tested at the Mach 5 intake temperature of 1000 deg C. So DARPA has paid for this test, which is why it is being conducted in the USA. Reaction Engines has an office in the USA to attract american interest and buyers of the engine. 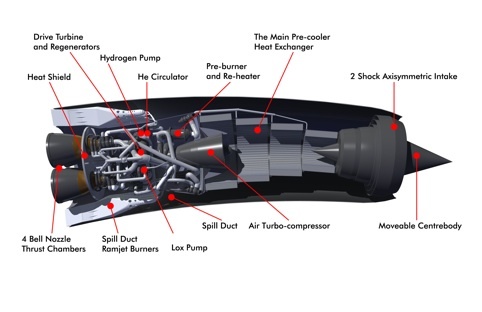 The design and developement of the engine is being done in the UK and currently a test facility is being built in Westcott, UK to test the core of the engine. So the technology has not been given away to the USA and this test will not result in ITAR regulations being slapped on the engine. Innovate UK, Space UK and ESA have provided £60 M to this project. I think you should check your facts before making any comments. By most measures, the US military budget is an order of magnitude larger than that of any other country except China where they are only about three times bigger. If you were a business, or an investor in that business, it makes a lot of sense to get on the good side of your biggest prospective customer … in short, money talks. As an aside, I’m pretty sure that China would simply LOVE to help develop that technology .. it looks like they’ve just about worked out the kinks in their W10 engine. The British Air Ministry signed an agreement with the United States to exchange all its high-speed research, data and designs and Bell Aircraft company was given access to the drawings and research on the M.52, but the U.S. reneged on the agreement and no data was forthcoming in return. Bell’s supersonic design was still using a conventional tail and they were battling the problem of control. We need to keep out technology here and find funding to support it. That is something that we are not good at unfortunately. Looks like there is a lot of good reasons to keep up with this development, I for one, did not know the UK component of this at all. There is a great lack of experimental, as opposed to modelling, R&D these days as experiments cost many times the cost of models and are far more difficult to do. As Einstein said (approximately anyway) one experiment can disprove any model. Some of the equipment being used in the tests was created for a previous program called “RASCAL” – millions of dollars worth of equipment at least. I think that adds a bit to the case for doing these tests in the US. It’s not as if Reaction engines is getting multiple hundreds of millions of dollars a year in funding like some of the other space ventures. I made a BBC 4 documentary about this company in 2012, and have seen the company expand from 3 men in an office to a company numbering in the 100’s, pioneering new manufacturing techniques (they have one of the world’s large vacuum furnaces – in Culham). It is breath taking to see such a great young vigorous company flying the flag for this country, with only modest funds from government, the rest being raised privately. Check out their website to see the ever lengthening roster of highly skilled job vacancies to see what a great future this company has. We’ll hear a lot about this company in the next few years, mark my words! Very impressive indeed. Do you have a link to the BBC4 documentary?